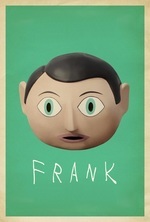 Based on author Jon Ronson's time spent playing keyboard as part of Frank Sidebottom's band. Young Jon, a keyboardist and aspiring songwriter, is stuck in the British suburbs at a boring job. Through a set of circumstances he starts playing keyboards for a band fronted by "Frank," a man who wears a large fake head. Jon soon learns that this will be no simple weekend gig, and the fact that Frank never takes off his fake head is only the tip of the trippy iceberg. The plot of the movie is loosely based on Jon Ronson's experiences playing keyboards for the band fronted by Chris Sievey, a/k/a Frank Sidebottom. Sidebottom's music gained some traction in the eighties - among his fans was Midge Ure of Ultravox. If the movie had limited itself to Ronson's story, it would have been good but not great. Instead, director Lenny Abrahamson, together with screenwriters Ronson and Peter Straughan, tell an "Almost Famous"-framed crowd-pleasing tale that manages to be both very funny AND deadly serious. At stake in the film are the importance of group synergies, the mystery of the creative process, and the innate right to be as deeply weird as you need to be in the face of ever-encroaching pressures to people-please and to create only if there's money in it. Stephen Rennicks, the composer, did fabulous work here. Maggie Gyllenhall, in the kind of role that Barbara Stanwyck or Jane Greer might have played years ago, has never been better. Wish I saw her in this vein more often. There are hints of "Five Easy Pieces" along the way, although I think "Frank" is a much better movie on many levels. Best of 2014 for me, up there with "Under the Skin." Really, I can't recommend it enough. I thought the music was surprisingly catchy. I've been singing 'I Love You All' to myself the whole weekend. hermanubis: That score was one of the best I've heard in some time. Rennicks ran the gamut from early-seventies psych/art rock to twee ukelele pop (not ukelele-ist!). All of it felt true to me. Oh, man, I was looking forward to Frank, but I never thought it would be this good. It just plays so elegantly with expectations. You expect the drummer to be wrong to mistrust Jon, and he's not; you expect Frank to remain an enigma, and he doesn't; you expect the story to have a damn thing to do with Frank Sidebottom, but nope. It's about so many things: the impossibility of expressing a true experience once it's over, the cruelty of the Internet in its ruthless search for authenticity, the difficulty of telling great performance art from abject anxiety. I particularly liked Jon as a deconstruction of the naive hero who slowly finds himself. Jon might not be a bad guy at heart, but he spends most of the film being totally narcissistic and exploitative, and he takes his friends on one hell of a miserable ride before he realizes it. It's also a really anti-Hollywood portrayal of mental illness. Frank isn't a holy fool who helps you find yourself, and nor is he a tortured genius, although these are both things he knows how to perform. He's a complete person, one whose generosity and humor and desire for authenticity are densely intertwined with his fears, compulsions, and illusions. Jon understands that in the end, at the cost of their friendship; Clara sees it from the beginning. As comedies go, it's actually pretty harrowing, but I know I'll see it again. I thought it was interesting how unsympathetic Jon ended up being. By not recognizing a fundamental difference between himself and the other band members, he ended up doing some real damage, even though he was just trying to succeed. It shows how much destruction and pain can be caused by people who really don't mean to hurt anyone - they just don't know any better. Being a good person, a good part of any community, requires more from one than just meaning no harm. It's also a really anti-Hollywood portrayal of mental illness. Frank isn't a holy fool who helps you find yourself, and nor is he a tortured genius, although these are both things he knows how to perform. Yeah, I was really struck by how the film's response to the common way of equating madness and creative genius is that sometimes an artist's madness is just... madness.